We lost 2 of the greatest rock and rollers of all time in the last couple days. What these 2 guys did for rock and roll is impossible to measure. Without a doubt rock and roll would not sound the same with out the contributions of Bobby Keys and Ian (Mac) Maclagan. If you‚ are not familiar with their work please take the time to look it up. That’s Bobby Keys you hear playing the immortal sax solo on “Brown Sugar”. You can hear Mac’s signature Wurlitzer electric piano on “Miss You”. They played on hundreds of the most important rock and roll songs of our time. I’ll bet these guys played on at least half of my favorite songs of all time. I met Bobby Keys in person backstage at a Rolling Stones show in Philadelphia around 2003. I was waiting to meet up with Charlie Watts when Bobby came along with his sax. I think he was looking for a quiet place to warm up. He just started up a conversation like we were old friends. I just remember his voice and that he was a big Dallas Cowboys fan. 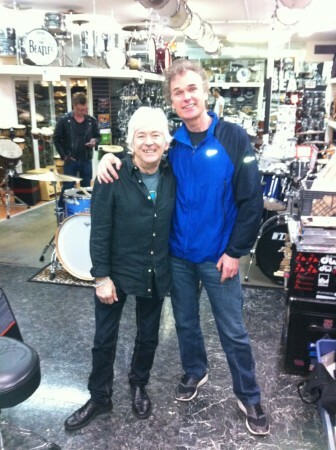 Earlier this year I was in disbelief when I walked up to the drum shop and saw Ian Maclagan standing quietly outside the front door. He was in town for a show at EMP and was scheduled to rehearse at the studio next door. He eventually came in the shop and had a great time looking around at all the memorabilia while recalling stories of his earliest rock memories. Very much like Bobby Keys he was like your instant old buddy. He invited us to his show the next day and we had a great hang before and after. I barely knew either of these guys but it honestly feels like I’ve lost 2 great friends. That’s the kind of impact they made on me. To have them both die within 24 hours of each other over 30 years later is one of those strange life coincidences that don’t really amount to anything but just make you wonder. Another weird coincidence. I saw Mac with the Faces at the first concert I ever attended in 1972. My 12 year old son attended his first concert yesterday, the same day we lost Mac. Go figure. Keep rockin’ guys. We miss you.